These brownies are pretty unique, at least when it comes to size. 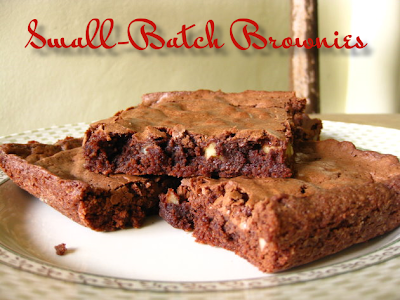 According to Good Housekeeping: Brownies!, "What's changed about brownies since the 1920s? Serving size. Cut these brownies into petite squares as the original recipe directs, rather than the larger, diet-busting bars we've become accustomed to." 1) Preheat oven to 350F. Grease 9-inch square baking pan. Line pan with foil, extending foil over rim; grease foil. In small bowl, with wire whisk, mix flour, baking powder, and salt. 2) In heavy 2-quart saucepan, melt butter and chocolate over low heat, stirring frequently, until smooth. Remove from heat. Add sugar, eggs, and vanilla; whisk until blended. With wooden spoon, stir flour mixture into chocolate mixture until just blended; stir in nuts. Spread batter evenly in prepared pan. 3) Bake until toothpick inserted in center comes out almost clean, about 20 minutes. Cool completely in pan on wire rack at least 1 hour. 4) When cool, lift foil, with brownie, out of pan; peel foil away from sides. Cut into 6 strips, then cut each strip crosswise into 6 pieces.